What an amazing man and career. He will be missed. The pic and the link below it actually are two separate links, the first the only respectful epilogue on the man's life I could find at the moment, and the second a clip from his last visit to Yankee Stadium where he was given the surprise honor of having a plaque dedicated to him for Memorial Park; his speech that followed was very touching and brought a tear to the eye considering all things. If you can see the whole ceremony, I highly recommend it; the Yanks do their ceremonies right. It's funny watching Jazz Jr experience HIS generation of Yankees. Judge, Sanchez, CC, Joe Girardi. Knowing he's going to look back at them the way I do to Donnie Baseball, Willie Randolph, then Jeter and Mo. Incomplete post! Forgot our man Mel S. One of those guys just always a Yankee, no matter what uniform he was wearing, you know? A great Yankee. Too bad he appeared in only 1 WS as a player. That was in 64, when he came up in the summer and pitched the Yanks into the WS. He lost the last game (game 7) to Gibson, when the Yanks were down 6-0, battled back, but ultimately lost 8-6. It was the end of an era for the Yanks, Yogi got fired aas manager, and the teams had years of awful. But Mel pitched well, lots of All-Star games, winning records on bad teams. Great pitching coach too. Mel came along at the wrong time, with penny-pinching by ownership who couldn't sign any player they needed. Good thing those days are behind us . . .
ps, looking at the HoF voting, Mo's vote is interesting. I wouldn't say he came at the wrong time; he was right on time for the 80s Mets and the 90s Yanks. I would venture that for what he lost or sacrificed as a pitcher, he gained back and then some as a pitching coach. 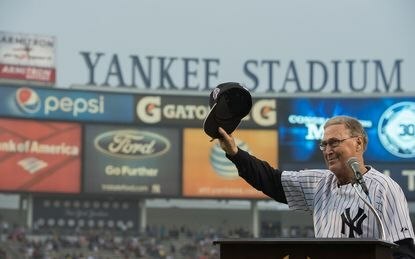 His plaque in Monument Park is well deserved. And don't forget his outstanding musical career with the Furious Five. Dude was a true legend.